The present invention relates generally to a narrowband rejection filter including a waveguide having an azimuthally asymmetric grating. The present invention is directed to a photosensitive matched inner clad or photosensitive depressed inner clad optical fiber design having an azimuthally asymmetric photoinduced Bragg grating that couples out of a forward propagating LP01 core mode over a narrow wavelength band while practically suppressing backreflection. The present invention further relates to system applications of the novel filter design. An optical fiber typically includes a core region of refractive index nco or n1. In double clad fiber designs, the core region is surrounded with an inner cladding having a refractive index nic or n1a, which is in turn surrounded by an outer cladding region having a refractive index noc or n2. The outer cladding is surrounded by an external medium having a refractive index next. A region of the fiber is photosensitive. "Grating tilt angle" is defined as the angle between the grating vector (the direction normal to the planes which define the grating periodicity) and the longitudinal axis of the fiber, where a physical tilt of the grating planes exists in the fiber. "Effective grating tilt angle" is defined as the value of "grating tilt angle" that is shown experimentally to give cladding-mode loss equivalent to the cladding-mode loss when an azimuthal asymmetry other than a physical tilt of the grating fringes is present in a grating inscribed in the waveguide. "Fundamental rejection notch" is defined to be the feature or dip in the transmission spectrum of the waveguide grating with the smallest value of transmission. Generally, this corresponds to the wavelength for which a reduction in the transmitted signal is desired. "Cladding mode losses" refers to losses or dips in the observed transmission spectrum for a waveguide containing a grating that occur due to coupling of the forward propagating modes of the waveguide to counter-propagating bound cladding modes (in the case of next< noc), or counter-propagating radiation modes (in the case of next ≥ noc). Peak cladding mode loss ("PCML") is the maximum "cladding mode loss" in a given transmission spectrum for a waveguide containing a grating. A passive component that couples light out of the forward propagating LP01 core mode of a single-mode telecommunications fiber with relatively negligible backreflection over a narrow wavelength band is a critical filtering element for lightwave systems in which no backreflected signal can be tolerated. The standard approach to filtering has been to couple the forward propagating LP01 mode to a counter propagating LP01 mode. Conventional Bragg gratings redirect the filtered signal back into the fiber. The higher the filtering ability of a traditional Bragg grating, the greater is the back reflection. However, in many systems, such as-WDM applications, the back reflection may cause deleterious effects, such as destabilizing the signal emitting laser. Presently, an available alternative is to install isolators, which protect sensitive equipment. However, the current cost of isolators is high. Work towards obtaining a narrowband rejection filter utilizing a grating in which the loss is not obtained through coupling to the counterpropagating LP01 core mode can be broken into two categories: coupling to the LP11 mode in a two mode fiber and coupling to cladding or radiation modes in a single-mode fiber. Suppression of the forward propagating LP01 core mode over a narrow wavelength band was shown in a two mode fiber. The backreflected signal at the peak rejection wavelength due to coupling to the counter-propagating LP11 core mode was measured to be -15dB, a value smaller than the commonly desired isolation for wavelength division multiplexing applications. In addition, two-mode fiber filters may have higher insertion losses than filters in single-mode fiber due to an imperfect mode-field match. Standard telecommunications fibers usually are single mode fibers. Attempts towards suppression of the core mode using single mode fibers have discussed how in a strong, tilted grating, significant coupling to the LP1m modeset could occur. Additionally, outcoupling light from a single-mode fiber utilizing a transversely asymmetrically shaped Bragg grating has been attempted. In Optical and Quantum Electronics, Vol. 28, 1996, pages 1641 to 1654, from which claim 1 starts in its precharaterising part, an optical fiber filter is disclosed which comprises a length of single mode fiber having an operating wavelength λ0, the length of the fiber including a photosensitive core having an index of reflection nco and a radius a, wherein the core has a LP01 core mode having an effective index of neff,01; a non-photosensitive inner cladding laterally surrounding the core, the inner cladding having an index of refraction nic, an inner radius A, an outer radius AB; and an outer cladding laterally surrounding the inner cladding, the outer cladding having an inner radius AB, an outer radius B and an index of refraction noc, where Δn+ is a difference between nco and noc; an azimuthally asymmetric grating having an effective tilt angle  and a period Λ, where 1°<<10°, and where Λ is lower or equal to (λ0 cos )/(2Neff,01); and wherein the maximum relative coupling coefficient for the cladding mode (max(RCC1m)) is greater or equal to 0.2 and the ratio RR of peak reflectivities for the LP01-LP1m coupling and for the LP01-LP01 coupling Is greater of equal to 1. The need remains for a filter design that allows for coupling out of the LP01 core mode with near, if not complete, suppression of coupling to the backward propagating fundamental mode. The invention is defined by the features of claim 1. The present invention offers a narrowband rejection filter that couples out of a forward propagating LP01 core mode having negligible backreflection. The filter includes a single mode waveguide, such as length of single mode fiber, having an operating wavelength λ0. The fiber includes a core having an index of refraction nco and a radius A, the core having an LP01 core mode with an effective index of neff,01. The fiber design includes a photosensitive matched inner cladding design, or a photosensitive depressed inner cladding design. In the photosensitive matched inner cladding (PMIC) embodiment, Δn- is zero and a photosensitive cladding region extends to a radius Rgrat. The photosensitive region may extend into both the inner cladding and the outer cladding. The photosensitivity of the photosensitive cladding region is a fraction γ of the photosensitivity of the core region. In the photosensitive depressed inner cladding (PDIC) embodiment, Δn. is nonzero and a photosensitive cladding region extends to a radius Rgrat. The photosensitivity of the photosensitive cladding region is a fraction γ of the photosensitivity of the core region. Rgrat may exceed AB, giving photosensitivity in both the barrier region and in the outer cladding region, that is, the photosensitive cladding region may comprise both the inner cladding and at least a portion of the outer cladding. An azimuthally asymmetric grating having an effective tilt angle  and a period (Λ), where Λ is less than or equal to approximately (λ0 cos)/(2neff,01) (to effect coupling to only counterpropagating bound or lossy cladding modes and counterpropagating core modes) is written in the photosensitive region of the fiber. More accurately, Λ ≤ (λ0 cos)/(2neff,01'), where neff,01' is the effective index of the core mode in the grating region, including the effect of any uniform unmodulated index change introduced during the grating writing process which may cause neff,01' to differ from neff,01. In all equations that follow, the value of neff,01 is defined such that neff,01 ≅ neff,01'. max(RCC1m), for 1≤ m ≤ 30, is greater or equal to 0.2 and the ratio of peak reflectivities for the cladding mode and the core mode, RR, is greater or equal to 1. Preferably, RR>3. As a result, the peak reflectivity of the core mode is less or equal to one third of the peak reflectivity of the cladding mode. In a depressed inner cladding (DIC) embodiment illustrating the state of the art, the core is laterally surrounded by a depressed inner cladding having an index of refraction nic, an inner radius A, an outer radius AB, and an inner depressed cladding width W, where W = AB-A. The inner cladding in turn is laterally surrounded by an outer cladding having an inner radius AB, an outer radius B, and an index of refraction noc. Δn+ is the difference between nco and noc, Δn- is the difference between nic and noc and nco >noc > nic. The values of Δn+, Δn-, and W allow the existence of a LP1m cladding mode, m≥1. In alternative embodiments 1°<<10° and the grating may comprise a chirped grating. In another preferred embodiment, 1250 nm < λ0 < 1600 nm, B ≈ 62.5 µm, Δn-= 0, Rgrat >1.5A, γ>0.5, 4 µm<MFD < 13 µm, 0.003<Δn+<0.012, and 2µm<A<8µm. In another preferred embodiment, 800 nm < λ0 < 1000 nm, B ≈ 62.5 µm, Δn-= 0, Rgrat >1.5A, γ>0.5, 2 µm<MFD < 30 µm, 0.003<Δn+<0.012, and 1µm<A<8µm. In yet another preferred embodiment, 1250 nm < λ0 < 1600 nm, B ≈ 62.5 µm, W>0.6A, Δn->0.003, Rgrat >1.5A, γ>0.5, 4 µm<MFD < 13 µm, 0.003<Δn+<0.012, and 2µm<A<8µm. In another preferred embodiment, 800 nm < λ0 < 1000 nm, B ≈ 62.5 µm, W>0.6A, Δn->0.003, Rgrat >1.5A, γ>0.5, 2 µm<MFD < 30 µm, 0.003<Δn+<0.012, and 1µm<A<8µm. The filter described above, may be used to manufacture a bandpass filter, a test signal suppresser, or gain flattening device. Additionally, the filter described above may be tuned, either in strength, center rejection wavelength, or other optical properties, through optical, mechanical, thermal, electrical, or other means to form tunable, reconfigurable, or switchable filters. Figure 1(a)-(b) are perspective and side views respectively of an optical fiber in accordance with the present invention detailing the fiber Bragg grating geometry coordinate system and grating tilt angle definition. Figure 2(a)-(c) are graphical representations of the radial distribution of refractive index for different embodiments of fibers. Figure 3 are contour plots of (a) max(η1m), (b) max(m), versus Δn- and W for a depressed inner clad fiber having λ0=1550 nm, A=5.86µm, B=62.5µm, Δn+ =0.0038, and n2=1.4446. Figure 4 are contour plots of (a) RR, (b) max(RCC1m), and (c) max(m') versus Δn- and W for the depressed clad fiber which was the subject of Fig. 3 with =1° and m=1 to 30. Figure 5 are contour plots of (a) RR, (b) max(RCC1m), and (c) max(m') versus Δn- and W for the depressed clad fiber which was the subject of Fig. 3 with =3° and m=1 to 30. Figure 6 are contour plots of (a) RR, (b) max(RCC1m), and (c) max(m') versus Δn- and W for the depressed clad fiber of which was the subject of Fig. 3 with =5° and m=1 to 30. Figure 7 are graphical plots of the transmission spectra versus wavelength at different grating tilt angles for (a) a conventional telecommunications grade single mode matched clad fiber, (b) a depressed inner clad (DIC) fiber, and (c) a photosensitive matched inner clad (PMIC) fiber. Individual spectra are displaced from nearest neighbors by +/- 10dB for ease in visualization. Figure 8 are graphical plots having different axial limits of the transmission spectrum versus wavelength for DIC fiber for in fiber fringe tilt of ∼4.0°. Figure 9 is a graphical plot of the reflection spectrum versus wavelength for the grating which was the subject of Fig. 8a. Figure 10 (a) is a graphical plot of the transmission spectrum for the DIC fiber for in fiber fringe tilt of ∼4.0° having grating geometry and exposure conditions similar to the grating in Fig. 7b. Figure 10 (b) is a graphical plot of transmission when the grating of Figure 10(a) is cascaded with the grating of Figure 7(b). Figure 11 is a simplified schematic view of a bandpass filter in accordance with the present invention. Figure 12 is a simplified schematic view of a test signal suppressor in accordance with the present invention. Figure 13 is a simplified schematic view of a spectral power flattener in accordance with the present invention. A simplified illustration of a filter 10 in accordance with the present invention is illustrated in Figure 1. The present invention comprises a narrowband rejection filter that couples out of a forward propagating LP01 core mode having negligible backreflection. The filter 10 includes a single mode waveguide, shown in Fig. 1 as a length of single mode fiber 12, having an operating wavelength λ0. The optical fiber 12 includes a photosensitive core 14 having a first transverse dimension or diameter 2A, a radius A (or rco) and being comprised of a material having a refractive index nco or n1. The core 14 has an LP01 core mode with an effective index of neff,01. Laterally surrounding the core 14 is an inner cladding 16 having an inner cladding or barrier radius AB (or ric). The fiber 12 may be a depressed inner cladding design illustrating the state of the art, a photosenstive matched inner cladding design, or a photosensitive depressed inner cladding design. The inner cladding 16 has a refractive index nic or n1a. For photosensitive designs, the inner cladding 16, and possibly even the outer cladding, includes a photosensitive region (see Figs. 2b and 2c) that extends to a radius Rgrat, where the photosensitivity of the cladding photosensitivity region is a fraction γ of the photosensitivity of the core 14. An outer cladding 18, having a refractive index noc or n2 and a radius B (or roc) laterally surrounds the inner cladding 16. The outer cladding 18 likewise is surrounded by an external medium having a refractive index next. Figures 1a and 1b also illustrate the Bragg grating geometry coordinate system definitions. A longitudinal optical axis z is defined by the center axis of the fiber 10. The optical fiber 12 is a single-mode uncoated optical fiber having a cylindrical cross-section. It is to be understood that other embodiments of the present invention may include fibers with coatings and fibers having different cross-sectional geometries known in the art. Figure 1b illustrates an azimuthally asymmetric Bragg grating 20 having an effective tilt angle  and a period (Λ), where Λ is less than or equal to approximately (λ0 cos)/(2neff,01) (to effect coupling to only counterpropagating bound or lossy cladding modes and counterpropagating core modes) written in the photosensitive region of the fiber 12. The fiber 12 may be subject to hydrogen loading or other processes known in the art to facilitate the writing of the grating. Due to the grating manufacturing process, the fiber 12 includes a grating process azimuthal asymmetry. More accurately, Λ ≤ (λ0 cos)/(2neff,01'), where neff,01' is the effective index of the core mode in the grating region, including the effect of any uniform unmodulated index change introduced during the grating writing process which . may cause neff,01' to differ from neff,01. In the present description, the value of neff,01 takes into account these unmodulated index change effects. Figure 2 illustrates the radial distribution of refractive indices for three embodiments of a fiber. The n value boundaries in Fig. 2 are simplified as discrete and instantaneous "effective step index" approximations. In Fig. 2, next<noc (or n2). However, Fig. 2 is not meant to limit values of next, as in functional filters, next may exceed noc. The difference between nco and nic creates a refractive index profile depressed well of width W, where W = AB-A, and of depth Δn-, where Δn- = noc - nic. The difference between nco and noc is defined as Δn+. The total height of the core refractive index profile, Δn, equals nco - nic = Δn- + Δn+. Fig. 2b illustrates the profile of a photosensitive matched inner cladding (PMIC) fiber. In the PMIC embodiment, Δn- is zero and the photosensitive cladding region extends to a radius Rgrat, where the photosensitivity of the photosensitive cladding region is a fraction γ of the photosensitivity of the core region. In this embodiment, the Bragg grating pattern 20 may be written on both the core and on the photosensitive portion of the inner cladding. The present invention allows for effective suppression of coupling to the backward propagating fundamental mode while exhibiting narrowband rejection filtering in transmission. Losses in highly reflective fiber Bragg gratings due to coupling to bound cladding modes or lossy radiation modes have been studied extensively and are undesirable when the fundamental rejection band due to forward propagating LP01 to counter-propagating LP01 coupling is used for filtering. The fiber design 10 includes an azimuthally asymmetric photoinduced grating in the core (and potentially the cladding for cladding photosensitivity) of a fiber with a strongly depressed inner cladding to suppress the forward propagating LP01 mode via coupling to a particular LP1m cladding mode. Alternatively, the fiber design 10 may include an azimuthally asymmetric photoinduced grating in the core and cladding of a matched clad fiber. Utilizing a grating having an effective tilt in the selected fiber design, the present invention obtains complete or nearly complete coupling directly to one of the LP11 hybrid leaky core modes. Coupling to the hybrid LP1m cladding mode (commonly called the "ghost" mode) has been observed in a shallow depressed inner clad fiber. Analysis of the observed short-wavelength losses for a tilted grating by comparing measured spectra to the calculated normalized coupling coefficients and resonance locations for the LP0m and LP1m modes confirms the origin of the sharp loss peak ("ghost mode") on the short-wavelength side of the fundamental rejection notch to be due to coupling to an LP1m cladding mode. The strong coupling properties of this mode are due to its hybrid nature. The mode has a field shape similar to the shape the LP11 core mode would have in the fiber if it was an allowed mode. The mechanism for strong coupling to one or a few LP1m modes for the PMIC fiber design is the extension of the grating into the cladding region. Because the grating extends into the cladding, the overlap between LP01 and LP1m modes is increased as compared to the equivalent matched clad fiber without cladding photosensitivity. The second mode cutoff wavelength, λc, for a particular fiber is defined as the operating wavelength below which propagation of the LP11 or LP02 core mode is enabled. assuming linear absorption and linear index mapping with the geometrical parameters as defined in Figs. 1 and 2. It can be shown that the impact on the RCC1,m values is qualitatively similar for the azimuthal grating asymmetries defined in Eqs. (5) and (6). Thus, for simplicity, in cases where an azimuthal asymmetry such as that due to sidewriting absorption is present in the grating, the effective grating tilt is defined such that, =eff, where eff represents the value of  that gives cladding-mode loss equivalent to the cladding-mode loss observed with the absorption asymmetry. Thus, ηLm ranges from 0 to 1, with 1 indicating that all power in the mode is confined to the core of the fiber. To achieve sufficient coupling, the maximum relative coupling coefficient max(RCC1m) for the cladding mode, for 1≤m≤30, in the present invention is greater or equal to 0.2 and the ratio RR of peak reflectivities for the core mode and the cladding mode is greater or equal to 1. Preferably, RR>3. As a result, the peak reflectivity of the core mode is less or equal to one third of the peak reflectivity of the cladding mode. The fiber design process for the depressed inner clad fiber Bragg grating filter of the present invention with inner clad photosensitivity comprises two steps: (1)Designing a fiber which has at least one LP1m mode having a significant value of η1m and (2) determining the optimum grating tilt for the particular fiber design. Typically, at the beginning of the single mode PDIC fiber design process, the desired operating wavelength of the filter (λo), the cladding radius (B), and the target mode field diameter (MFD) are known. Additionally, it is generally desired to have the second mode cutoff wavelength (λc) to be close to, but less than, the operating wavelength. In optical fibers, n2 ≈ nsilica at the design wavelength. These constraints on the fiber design limit the allowed values of A, and n1. Thus, the two fiber parameters that must be determined through the fiber design process are Δn- (n1a) and W (AB). Since the DIC filter operates by coupling to a strongly bound, but leaky LP1m cladding mode, the value of next is not crucial for the operation of the fiber and grating combination. However, in the fiber design process, we take next to be smaller than n2 by an amount sufficient to allow the existence of greater than 30 LP1m cladding modes. For purposes of comparing to measurements made in air before recoating, we typically choose next=1.0. For any two values of Δn- and W, RCC1m and η1,m values for m=1 to 30 may be calculated using the equations detailed above. These RCC1m and η1m values then may be sorted to determine the radial cladding mode numbers, max(m) and max(m'), which have the largest η1m (max(η1m)) and RCC1m (max(RCC1m)) values, respectively. Figs. 3a and 3b are contour plots of max(η1m) and max(m) as a function of Δn- and W for a particular fiber design example. In this example, at the operating wavelength of 1550 nm, a MFD target was ∼10.5 nm and the cutoff wavelength target was 1500 nm. Thus, with Δn-=0, B=62.5µm, and n2=1.4446, A was chosen to be 5.86µm and Δn+ (n1) was chosen to be 0.0038 (1.4484). A and n1 are chosen to give a slightly larger MFD and cutoff wavelength than desired with Δn-=0, with the knowledge that adding a depressed inner cladding will reduce these quantities. Note that at each contour in Fig 3b, an abrupt change in max(m) to the value identified on the contour occurs. For example, at the point in Fig. 3b where W=4 and Δn-=0.007, the order for maximum η1m changes from 5 for W<4 to 6 for W>4. Fig. 3a shows that as W and Δn- increase, in general, the maximum core confinement factor (max(η1n)) increases. The nonmonotonic behavior of max(η1m). versus W for a given Δn- in this plot is due to the tradeoff of max(RCC1m) between different radial orders. This tradeoff is made more obvious by comparison to Fig. 3b. As W and Δn-simultaneously increase from the origin in Fig. 3b, the order with η1m=max(η1m) assumes the strong core confinement property of the LP11 hybrid mode. Typically, when max(η1m) exceeds 0.2, we consider the mth L=1 asymmetric cladding mode to be sufficiently confined to the core to have LP11 hybrid ghost mode properties. In a preferred embodiment, RR>3 and max(RCC1m)>0.25. The first of these limits assures that the tilt angle is large enough so that in the transmission spectrum for this grating, the depth of the rejection notch due to LP01-LP1m coupling will be greater than the depth of the rejection notch due to LP01-LP01 coupling. The second of these limits ensures that the tilt angle is not so large that the rejection notch depth for LP01-LP1m coupling becomes too small to be useful. RR may be determined from experimental measurements. As an example, Figs. 4a-c are plots of RR, max(RCC1m), and max(m') versus W and Δn- for =1°. Figure 5 are contour plots of (a) RR, (b) max(RCC1m), and (c) max(m') versus Δn- and W for the depressed clad fiber which was the subject of Fig. 3 with = 3° and m=1 to 30. Figure 6 are contour plots of (a) RR, (b) max(RCC1m), and (c) max(m') versus Δn- and W for the depressed clad fiber of which was the subject of Fig. 3 with =5° and m=1 to 30. From these plots, we see that the condition of RR>3.0 and max(RCC1m) >0.2 are met simultaneously in the =3° and =5°case (Figs. 5a and 6a-b). These plots show that the region of W/Δn- space where RR peaks is relatively insensitive to , this region being relatively well characterized by setting a limit on the core confinement factor max(η1m) which is not dependent on . Using the plots and the sufficient coupling criteria, values of W and Δn- are selected for a particular set of operating conditions and fiber design conventions. For conventional telecommunication fiber for operation at 1550 nm, an embodiment of a filter in accordance with the present invention is found at W>0.6A and Δn- >0.003 to give core confinement factors (max(η1m)) >0.2, and 1°<<10° to satisfy the RR and max(RCC1m), requirements. In other embodiments 1°<<10° and the grating may comprise a chirped grating. The fiber design process for a PMIC fiber in accordance with the present invention is similar to the DIC fiber design process. As before, the desired operating wavelength of the filter (λo), the cladding radius (B), and the target mode field diameter (MFD) are known or are determined based on the requirements of the system to which the filter will be coupled. It is generally desired to have the second mode cutoff wavelength (λc) to be close to, but less than, the operating wavelength. In optical fibers, n2 ≈ nsilica at the design wavelength. These constraints on the fiber design limit the allowed values of A, and n1. Thus, the two fiber parameters for PMIC and PDIC fibers that are determined through the fiber design process are Rgrat and γ. The PMIC filter of the present invention operates by coupling to a strongly bound, but leaky LP1m cladding mode. Accordingly, the value of next is not crucial for the operation of the fiber and grating combination. However, in the fiber design process, next is selected to be smaller than n2 by an amount sufficient to allow the existence of greater than 30 LP1m cladding modes. For purposes of comparing to measurements made in air before fiber recoating, a value of next=1.0 is chosen. 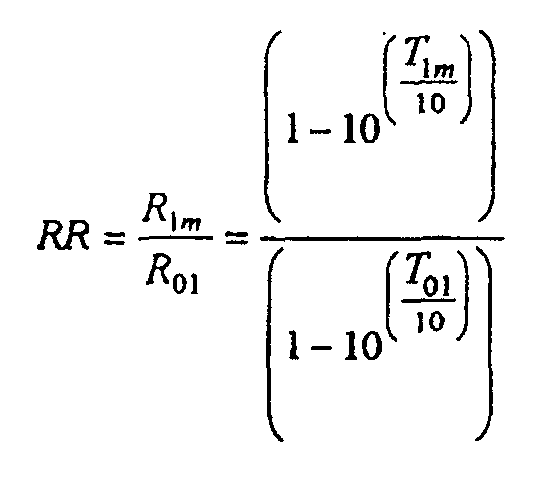 For any two values of Rgrat and γ, RCC1m and η1,m values for m=1 to 30 may be calculated using the equations detailed above. The RCC1m and η1m values then may be sorted to determine the radial cladding mode numbers, max(m) and max(m'), which have the largest η1m (max(η1m)) and RCC1m (max(RCC1m)) values, respectively. These values may then be plotted versus effective grating tilt angle in a manner similar to the plots of Figs. 4-6. Limits on Rgrat and γ are achieved in a preferred embodiment by forcing RR>3 and max(RCC1m)>0.2. An embodiment of the present invention includes a PMIC fiber having 1250 nm<λ0<1600 nm, B∼62.5µm, 1200nm<λc<1600nm, 4µm<MFD<13 µm, Δn-= 0, Rgrat >1.5A, and γ>0.5. A particular embodiment further exhibits the following values: 0.003<Δn+<0.012 and 2µm<A<8µm. Another embodiment includes a PMIC fiber having 800nm<λ0<1000 nm, B∼62.5µm, 800nm<λc<1600nm, 2µm<MFD<30 µm, Δn-= 0, Rgrat>1.5A, and γ>0.5. A further embodiment further has 0.003<Δn+<0.012 and 1µm<A<8µm. Finally, yet another embodiment of the present invention includes a PDIC fiber having 1250 nm < λ0 < 1600 nm, B ≈ 62.5 µm, W>0.6A, Δn->0.003, Rgrat >1.5A, γ>0.5, 4 µm<MFD < 13 µm, 0.003<An+<0.012, and 2µm<A<8µm. In another PDIC fiber embodiment, 800 nm < λ0 < 1000 nm, B ≈ 62.5 µm, W>0.6A, Δn->0.003, Rgrat >1.5A, γ>0.5, 2 µm<MFD < 30 µm, 0.003<Δn+<0.012, and 1µm<A<8µm. For the DIC design ( Δn_>0.003 and W>0.6A) and the PMIC design (Rgrat>1.5A and γ>0.5) gratings were written as a function of tilt angle in three fibers having λ0=1550nm, nclad=1.4446, next=1.0, and B=62.5µm. The three fibers included: 1) A conventional matched clad (MC) telecommunications grade fiber (such as SMF-28 from Corning, Inc., Corning, NY) having A∼4.15µm, MFD∼10.5 µm, Δn+∼0.0046, 2) a wide, moderately deep depressed clad (DIC) fiber having A=5.86 µm, W=3.85µm (AB=9.71µm), Δn+=0.0038, Δn-=0.0064 and a MFD=9.5 um, and 3) a photosensitive matched inner cladding (PMIC) fiber having A=4.7 µm, Δn+=0.0052, Rgrat=9.4µm, γ∼1.0, and a MFD=10.1 um. The gratings written were 15mm in length, unapodized, and the spectra were measured after recoating (next∼n2). The gratings were written in the fibers using sidewriting phase mask exposure technique. The gratings were written using an excimer laser at 248 nm with a total dose sufficient to give -20dB losses in transmission for the first rejection band to reach that value of rejection. A variable tilt angle was achieved by orienting the phase mask rulings at an angle of 90°+/n2 from the fiber axis. Note that the factor of 1/n2 is included as a first order correction to the bending of the fringes in the fiber core due to the cylindrical symmetry of the fiber in the small angle and small core approximation (<10°, A<<B). Transmission spectra for gratings written in these three fibers as a function of the tilt  of the grating fringes with respect to the fiber normal are plotted in Fig. 7a (MC fiber), Fig. 7b (DIC fiber), and Fig. 7c (PMIC fiber). The spectra for different angles are displaced by -10dB on the vertical axis with respect to the next closest angle for ease in viewing. As indicated by the legend for the plots, the spectra corresponding to =0°, 1.5°, 2.9°, 3.6°, 4.0°, and 4.3° are displayed in descending order on the plots. Note that lack of photosensitivity limited the strength of the transmission notches that could achieved in the MC fiber for ≥4°. The evolution of the rejection notches as a function of increasing tilt angle is markedly different for the DIC and PMIC fiber types as compared to the MC fiber type. While all three fiber types exhibit similar fundamental rejection notches for =0°, and exhibit shifting of the fundamental notch to higher wavelengths and weakening as the grating tilt increases, the cladding mode structure evident for the MC fiber (Fig. 7a) is much less peaked than the structure for the DIC fiber (Fig. 7b). In particular, as the tilt increases in Fig. 7b, note the emergence of a strong, localized rejection notch due to strong coupling of the forward propagating LP01 core mode to the counter-propagating LP11-hybrid cladding mode (the LP1m cladding mode with max(RCC1m)). At tilt angles exceeding ∼2° in this figure, the strength of the LP11-hybrid rejection notch exceeds that of the fundamental rejection notch, due to coupling of the forward propagating LP01 core mode to the counterpropagating LP01 core mode and nearly complete suppression of the fundamental notch occurs for ∼4°. The evolution of the transmission spectra versus  is similar for the PMIC fiber design of Fig. 7c. To illustrate the properties of a fiber design for the DIC fiber filter, a value of =4° was chosen to give nearly complete suppression of the coupling of the forward propagating LP01 core mode to the counterpropagating LP01 core mode in the depressed clad fiber detailed above. Fig. 8a is a transmission spectrum for this grating over a large wavelength range. The transmission minimum due to the LP01-LP01 coupling is not visible in this figure, but a strong transmission minimum is observed at λ∼1552.2nm due to LP01-LP11 hybrid mode coupling. The careful choice of tilt angle (4°) has given nearly complete suppression of LP01-LP01 coupling this fiber. Fig. 8b is a similar plot but with an expanded vertical scale. On this plot, the transmission minimum due to LP01-LP01 coupling is not obvious at a wavelength of just greater than 1554 nm. Although significant coupling to other higher order cladding modes is observed in Figs. 8a and 8b for λ<1550 nm, the passband (∼2nm in this example) between the higher order and the LP01-LP1m loss notches allows for the application of this device in some bandpass filter applications. This passband is not present for a matched clad fiber design and, while present, the passband is not as large for the PMIC fiber design. Fig. 8c illustrates the same information as Fig. 8a, but has a scaled horizontal axis. Fig. 9 shows the corresponding reflection spectrum. This spectrum was calibrated using the signal reflected from a cleaved endface (Fresnel reflection) as a reference. Note from this figure that the reflection of the LP01-LP01 coupling resonance is suppressed by at least -20dB. However, the rejection mode (due to LP01-LP11 hybrid mode coupling) has suppression of at least -32dB, a significant performance improvement. This offers effectively complete suppression of reflection in the rejection band. From Fig. 7c it may be noted that a PMIC fiber design can achieve similar rejection performance for the appropriately tuned angle, but with a smaller passband to shorter wavelengths. Additionally, it may be noted that while the spectra of Figs. 8 and 9 have been obtained from an unchirped grating, the width of the rejection notch may be increased by chirping the grating. A bandpass filter 100 in accordance with the present invention is illustrated in Fig. 11. The bandpass filter includes two cascading filters, 110 and 120, with spectra similar to that of Fig. 8, but different peak rejection wavelengths. Each filter has a grating as described above. A signal including wavelengths λ1, λ2, and λ3 is introduced in the bandpass filter, where λ1<λ2<λ3. λ2 lies in the passband between rejection notches for λ1 and λ3. The filters 110 and 120 are designed to drop λ1 and λ3, respectively, to allow only the filtered signal having a wavelength λ2. The usable bandwidth of the bandpass is limited by the flat region between the max(LP1m) peak and the subsidiary cladding mode peaks to the shorter wavelength side. For example, for the filter of Fig. 8b, the usable bandwidth to shorter wavelengths is approximately 2 nm. Figs. 8a and 10a illustrate transmission spectra for individual gratings that can be combined, under appropriate tensioning, to give a bandpass filter for use in a system with a channel spacing of approximately 100GHz (0.8 nm). Fig. 10b illustrates the transmission spectrum for the two grating cascade, which exhibits a desired bandpass structure. A test signal suppressor 200 is illustrated in Fig. 12. The suppressor includes one filter 210 of the type shown in Fig. 8. A signal including a plurality of wavelengths is introduced into the suppressor 200. The wavelength to be dropped, λ1, lies to shorter-wavelengths from the wavelengths, λ2, to. be passed. λ2 lies in the spectral region transmitted by the filter with low loss. λ1, which is the test signal, lies in the spectral region with high transmission loss. Using the spectrum of Fig. 8c as an example, large rejection with negligible back reflection is accomplished at the center wavelength of the filter (∼1552.2nm), while negligible attenuation occurs to higher wavelengths. The filter is designed so that the signal to be suppressed occurs at the center wavelength of the filter, to obtain the desired test signal suppression functions. A gain or spectral power flattener 300 in accordance with the present invention is illustrated in Fig. 13. An input signal with varying power as a function of wavelength is flattened after transmission through a filter 310 of the appropriate design. Gain flattening is accomplished by shortening the grating length or chirping the grating period of a filter in accordance with the present invention. Additionally, the filter described above may be tuned, either in strength, center rejection wavelength, or other optical properties, through optical, mechanical, thermal, electrical, or other means to form tunable, reconfigurable, or switchable filters. Those skilled in the art will appreciate that other waveguides having different geometries and parameters may be used to manufacture filters and a variety of lightwave systems in accordance with the present invention. While the present invention has been described with a reference to exemplary preferred embodiments, the invention may be embodied in other specific forms. Accordingly, it should be understood that the embodiments described and illustrated herein are only exemplary and should not be considered as limiting the scope of the present invention. Other . variations and modifications may be made in accordance with the scope of the present invention. the fiber (12) is a photosensitive depressed or photosensitive matched inner cladding fiber, wherein at least the region of the cladding adjacent the core is also photosensitive, said photosensitive cladding region extending up to a radius Rgrat and having a photosensitivity being a fraction γ of the photosensitivity of the core region. The filter of claim 1, wherein the fiber is a depressed inner clad fiber and wherein the inner cladding has a thickness W, where W = AB-A, and Δn- is the difference between nic and noc and nco > noc > nic, the values of Δn+, Δn- and W allowing the existence of the LP1m cladding mode, wherein m≥1. The filter of claim 1 or 2, wherein RR≥3. The filter of one of claims 1 to 3, wherein 1°<<10°. The filter of one of claims 1 to 4, wherein the grating comprises a chirped grating. The filter of one of claims 1 to 5, wherein the fiber is a photosensitive matched inner cladding fiber and where 1250 nm < λ0 < 1600 nm, B ≈ 62.5 µm, Δn-=0, Rgrat >1.5A, γ>0.5, 4 µm<MFD < 13 µm, 0.003<Δn+ <0.012, and 2 µm<A<8 µm. The filter of one of claims 1 to 5, wherein the fiber is a photosensitive matched inner cladding fiber and where 800 nm < λ0 < 1000 nm, B ≈ 62.5 µm, Δn-=0, Rgrat >1.5A, γ>0.5, 2 µm<MFD < 30 µm, 0.003<Δn+ <0.012, and 1 µm<A<8 µm. The filter of one of claims 1 to 5, wherein the fiber is a photosensitive depressed inner cladding and where 1250 nm < λ0 < 1600 nm, B ≈ 62.5 µm, W>0.6A, Δn->0.003, Rgrat >1.5A, γ>0.5, 4 µm<MFD < 13 µm, 0.003<Δn+ <0.012, and 2 µm<A<8 µm. The filter of one of claims 1 to 5, wherein the fiber is a photosensitive depressed inner cladding and where 800 nm < λ0 < 1000 nm, B ≈ 62.5 µm, W>0.6A, Δn->0.003, Rgrat >1.5A, γ>0.5, 2 µm<MFD < 13 µm, 0.003<Δn+ <0.012, and 1 µm<A<8 µm. A bandpass filter (100) including the filter of one of claims 1 to 9. A test signal suppressor (200) including the filter of one of claims 1 to 9. A gain flattening device (300) including the filter of one of claims 1 to 9.